ANA Niger, The Arts-Muse Fair blog Host Public Discussion On The Legacies Of Late Abubakar Gimba. 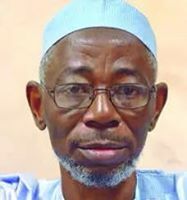 The birthday of Abubakar Gimba, late novelist and former President of the Association of Nigerian Authors (ANA) is March 10. The writer whose published novels include A Trail of Sacrifice, Witnesses to Tears, Innocent Victims, Sacred Apples, Sunset for A Mandarin and other poetry, short story and essay titles died on 25th February, 2015 aged 63. To preserve and promote his invaluable legacies of fine writings, strong character and philanthropy, the Association of Nigerian Authors, Niger state chapter in collaboration with The Arts-Muse Fair news blog will mark his 65th posthumous birthday with a public discussion, themed "Abubakar Gimba: His Writings & Influences” on Saturday, March 11, 2017 at the Niger State Book and other Intellectual Resource Development Agency (NSBIREDA) Hall, F-layout, Minna, Niger State, Nigeria by 12 noon. Mal. Abdullahi Ismaila Ahmed, a lecturer in the Dept. of English, IBB University, Lapai, will present a paper at the event. Mal. Denja Abdullahi, the Nat. President of ANA will be the chairman of the event. ANA Niger Holds Writer's Spell Tomorrow.